First of all, the annual observation that Le Grand Palais is the most extraordinary, wonderful collector car auction venue in the world. The setting is epic and unlike the usual fabric-covered marquee or bland multi-purpose convention center ballroom the filigree of cast columns and arches, glass-paned roof and artfully-placed rivets is endlessly fascinating. Chris Sharpe attended and wrote up 26 of the most important cars while admiring the architecture; accomplishing both is no mean feat. In 2019 three lots sold on hammer bids over $1 million, but five did not, leaving a lot of money on the table at the end of the day. 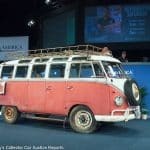 At $14.4 million, the unsuccessful high bids were well over those that closed their deals, continuing the trend seen most recently in Scottsdale where the top of the collector car market has been having difficulty in completing transactions. 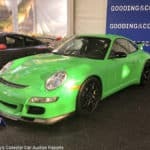 Expect that to continue next week at the Amelia Island auctions. Lot # 232 1931 Bentley 8-Liter Sports Tourer; S/N YX5116; Green/Dark Green leather, mid green ca; Estimate $680,303 – $907,070; Rebodied or re-created, 3 condition; With Reserve; Hammered Sold at $776,679 plus commission of 15.00%; Final Price $893,181. – RHD. Separate original Weymann-style 4-door, 4-light saloon body by H.J. Mulliner included in sale. Hartford friction shock absorbers, cycle wings, folding windshield, dual aeroscreens, step plates, wire mesh Le Mans grille, single sidemount spare, short wheelbase chassis. – Rebodied for David Black with this Vanden Plas style tourer built by Elmdown in the 80’s. Showing lots of use, paint chips and worn leather on the drivers cutaway. Paint chips on mudguards from good use. Rugged old Bentley lorry with its fair share of warmth and patina. Represented as the original chassis, engine, gearbox and other parts. – Ideally suited for tours, as it has been for years by the seller, more than good enough to be used and enjoyed without concern for the occasional stone chip or muddy-booted grandchild and bought for a price that reflects its charm and usability. Lot # 234 1934 Aston Martin 1 1/2-Liter Mark II Sport Tourer; S/N I4466L; Red/Mid biscuit leather; Black cloth top; Estimate $317,475 – $385,505; Older restoration, 3- condition; With Reserve; Not sold at Hammer bid of $238,106. – RHD. Counter-balanced crankshaft and dry sump lubrication, Black painted wire wheels and outboard rear spare wheel, bucket style seats, varnished wood dash, exposed side exhaust, cycle fenders. – Rough paint on the hood and scuttle top. There is an orange peel finish on the front cycle wings. Cheap carpets. Original, dusty and dirty engine bay. Chrome side pipe covers are rusty, oh dear! They’re so easily changed, a poor show unfortunately. One of only 166 Mark IIs built, deserves better attention. 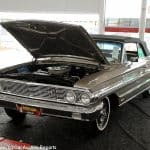 – Despite the attraction of the more durable and powerful Mark II engine the overall condition of this car is an invitation to spend a fortune giving it the care it deserves, and needs. Once started, money will flow into it nearly unquenched, something the Grand Palais bidders recognized with this cautious bid. 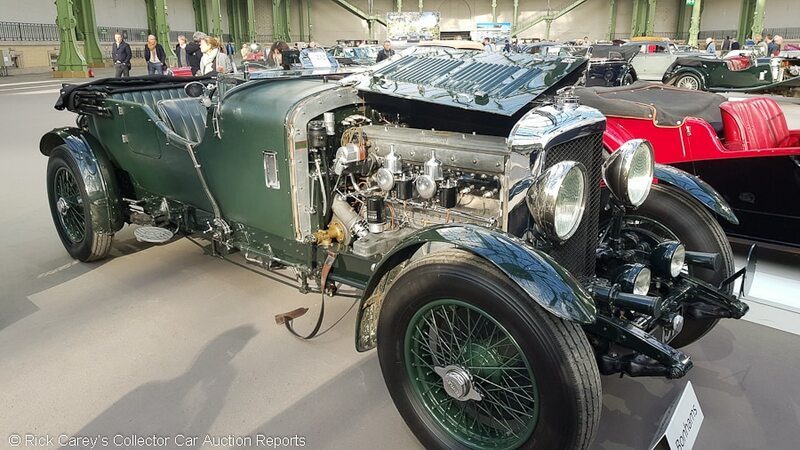 Lot # 237 1928 Bentley 6 1/2 Liter Sports Saloon, Body by Freestone & Webb; S/N BR2353; Engine # BR2351; Black/Chestnut Brown; Estimate $1,360,606 – $1,587,373; Older restoration, 3 condition; With Reserve; Hammered Sold at $1,133,838 plus commission of 15.00%; Final Price $1,303,914. – Single Smiths 50BVS Carburetor, 147bhp at 3,500rpm, 147bhp at 3,500rpm, 4-Speed ‘C’ gearbox, semi-elliptic Leaf spring suspension, 4-wheel mechanical servo assisted drum brakes, dual sidemounts with mirrors, luggage trunk, pullup division window, rear seat clock and speedometer, gorgeous burl wood and inlay. – Fabric-covered body. A first impression is good paint, slightly greying vinyl roof. Road dust on the chassis but otherwise well kept. Known history from new. Surface cracked and soiled but sound original upholstery. Represented as matching numbers throughout. A strong car holding up well but on account of the restoration’s age (it was done in the 60’s) and even the 2003 engine rebuild, a thorough road test and deep inspection of all the mechanicals are in order. – An outstanding, charismatic, carefully preserved and highly original car. The survival of the original Weymann pattern Saloon coachwork by Freestone & Webb is particularly notable as so many of these were put aside in favor of more sporting Vanden Plas Tourer replicas. This one is thoroughly documented through its limited ownership history and almost religiously preserved. An outstanding Big Six that brought a realistic price with a strong breath of originality premium. 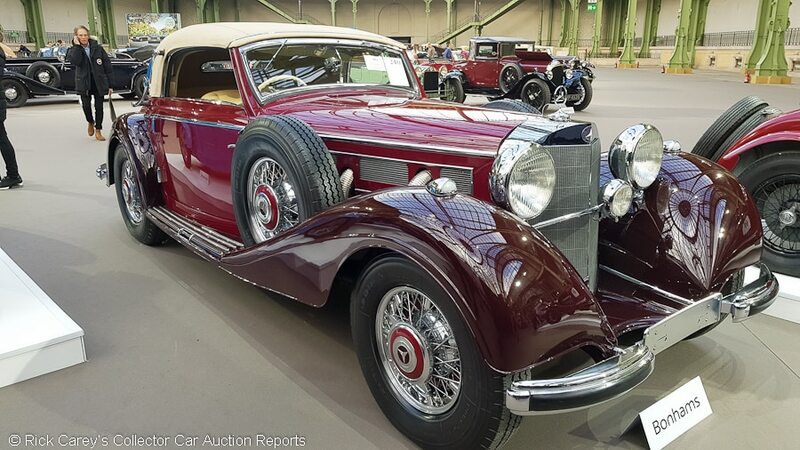 Lot # 240 1939 Mercedes-Benz 540K Cabriolet A, Body by Sindelfingen; S/N 408386; Red, Claret fenders/Parchment leather; Beige cloth top; Estimate $1,757,449 – $2,097,600; Older restoration, 2- condition; With Reserve; Hammered Sold at $1,559,027 plus commission of 15.00%; Final Price $1,792,881. – RHD conversion. Chrome wire wheels, blackwall tires, rare five-speed gearbox, mother-of-pear instrument panel, white steering wheel and gearshift, dual sidemounts with mirrors – Factory replaced block in the 30’s, formerly the property of His Majesty King Hussein bin Talal, former King of Jordan, and restored for him 1990-91 in Germany. Superbly finished contrasting paint finish. The exterior chrome is in A1 condition. The seat leather has slightly aged but is holding that perfect aroma. Faded old top boot. A truly great car, that anyone would be very proud to take home. – Sold by Christie’s at Royal Albert Hall in 1987 along with Bugatti Type 41 Royale (for $9,764,585) where it brought $507,758 (GBP 286,000). Needless to say it’s had a lot of attention since then. The Cab A, with its awkward folded top standing higher than the occupants’ heads, is not the most attractive of Sindelfingen’s open cars, but it is practical and this is an appropriate price for this one’s history and aging restoration. 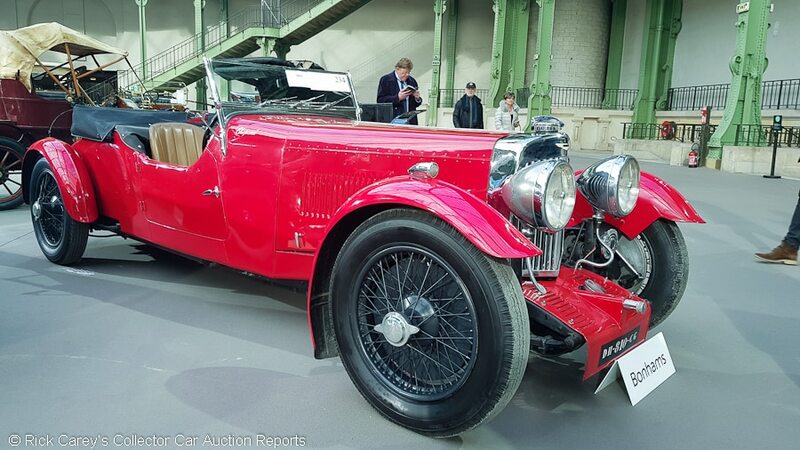 Lot # 241 1939 Alvis 4.3-Liter Short Chassis Tourer, Body by Vanden Plas; S/N 14812; Black, Red/Red leather; Black cloth top; Estimate $481,881 – $538,573; Recent restoration, 3+ condition; With Reserve; Hammered Sold at $393,063 plus commission of 15.00%; Final Price $452,023. – RHD. Innovative 4 speed synchromesh gearbox, black and red wire wheels, superb flying mascot, driving lights and chromed twin horns – Built as a high compression factory demonstrator and raced at Brooklands to honorable results while on loan to Tommy Wisdom. Just four owners since the factory. A good standard recent paint job but some preparation marks on the fenders. Engine rebuilt. The wheels and new tyres look perfect. The engine and bay are tidy but the bulkhead has been poorly painted in matte black. The exterior chrome has been refurbed but not to the best standard. The tonneau cover is worn. A good old girl ready to stand proud with the right care and fully usable as it is, and has been. – One of only 12 of these cars produced and high point in 30’s coachwork design. Closed here post-block in a transaction that highlights the 137 horsepower performance, the all-synchro gearbox and the really pretty, low slung cutaway door coachwork this is a moderate but realistic price for an exceptional automobile. 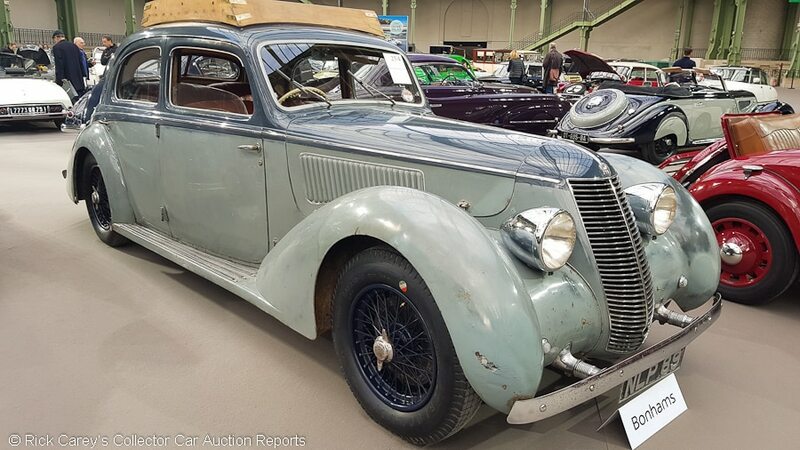 Lot # 243 1937 Delage D8-120 3-pos. Drophead Coupe Mylord, Body by Chapron; S/N 50790; Smokey Blue/Cream Leather; Beige cloth top; Estimate $736,995 – $850,379; Recent restoration, 2+ condition; With Reserve; Not sold at Hammer bid of $612,273. – RHD. White wall tyres, body color wire wheels, chrome hub caps, chromed exposed manifold side pipes, inset rear spare, luggage rack, leaf spring 4-spoke woodrim steering wheel, Cotal pre-selector 4-speed, spotlight. – Represented as matching numbers. Restoration finished two years ago with excellent paint, chrome and interior with perfect cream leather and varnished walnut cappings and dash. Excellent work in every area, one of the best here. There are only minor faults such as the rear light mounts not polished. The tailpipe is showing some heat use. All round superb, a buyer! – One of the finest of French grandes routieres, now treated to a high quality restoration with meticulous attention to detail. The reported high bid here is appropriate, the estimate range is generous. The D8 120 is one of few cars where dropheads or cabriolets are not as valuable as the LeTourneur & Marchand Aerosport coupes, and one look at an Aerosport would leave no doubt why. 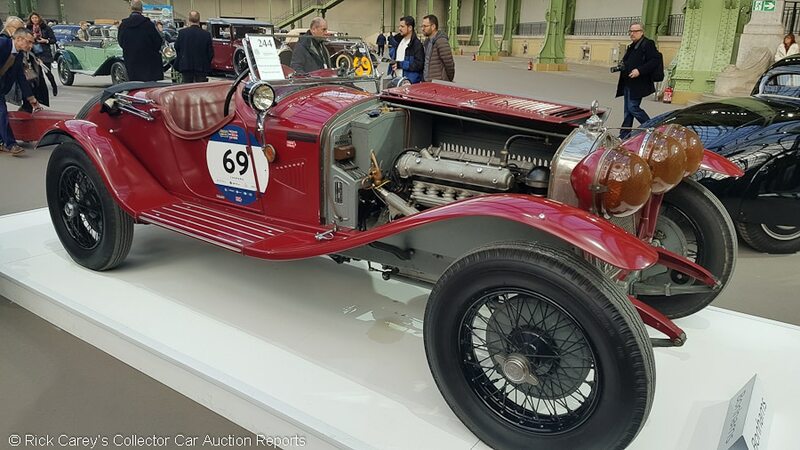 Lot # 244 1930 Alfa Romeo 6C 1750 4th Series Gran Sport Spider, Body by after Zagato; S/N 8513033; Engine # 8513033; Red/Dark Brown leather; Estimate $1,360,606 – $1,814,141; Competition restoration, 3- condition; With Reserve; Not sold at Hammer bid of $1,190,530. – RHD. Folding windshield, center driving light, radiator stone guard, dual rear spares, lighted rear license plate light, Black wire wheels, dual spotlight-mirrors, many spare and replacement parts. – Mille Miglia participant 1930 and 1931, Ex-Luigi Scarfiotti, Scuderia Ferrari, Coachwork by in the original Zagato Grand Sport style as originally fitted to this chassis new. Original and matching numbers frame, chassis, engine, compressor, gearbox, drive train, bulkhead, and fuel tank (the complete rolling chassis). Retaining original SF ‘Scuderia Ferrari’ stamps on crankshaft etc. and period race modifications including double ‘Auto-Vac’ fuel system. The exterior is dull and aged. The fantastically designed front axle is aged looking as is the suspension, hubs and drums. The engine bay is oily here and there but is largely in original condition. The engine block is poorly hand painted in matte black. The leather seat tops are slightly worn. A working car with the best pedigree, a wonderful Alfa that ran the 2018 Mille Miglia and likely has a standing invitation. Carefully and forensically documented due to the appearance of another 1750 claiming the same chassis number. – Sold by Worldwide at Houston in 2005 for $1,100,000, then by Bonhams at Quail Lodge in 2008 for $1,107,000. There should be little concern that it is worth more than the reported high bid, a magnificent and historic Alfa. 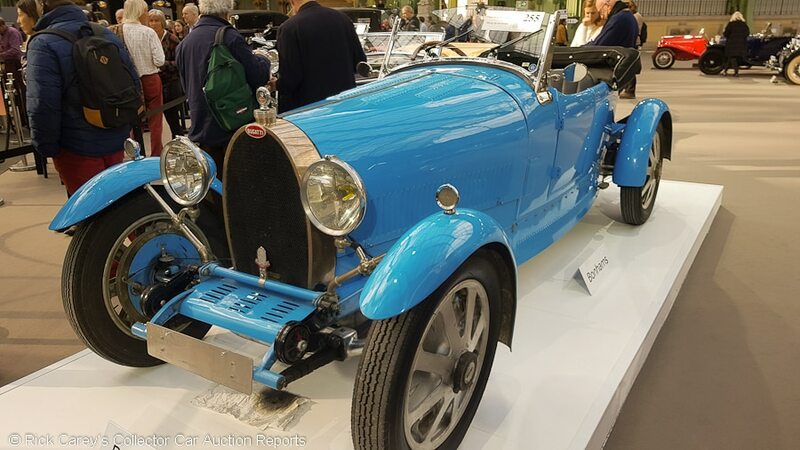 Lot # 246 1930 Bugatti Type 40 Open Roadster; S/N 40852; Engine # 770; Blue, Black fenders/Black leather; Estimate $430,858 – $521,565; Visually maintained, largely original, 3 condition; With Reserve; Not sold at Hammer bid of $362,828. – Basic tool kit tray, black wire wheels, two rear-mounted spare wheels – Represented as matching numbers with a known ownership history through most of its life. The horseshoe radiator is not polished at all, or the headlamp rims. The exterior paint looks fresh, if a little uneven but pretty good for this metalwork. The seat and door cards are finished in a grey alligator effect trim, honestly, they are. The chassis and engine are dirty and aged. A bit of a strange presentation. – And a bit of a strange Bugatti, looking a lot like a Model A Ford in profile. The comparison is informative. The Model A had a 201 cubic inch 40hp four, the Type 40 a 90 cubic inch 60 hp four. There would be no contest in a straight up speed competition, nor on the auction block where this Type 40 was bid to a reasonable number reflecting its age and the shortcomings of its condition. Lot # 247 1938 Mercedes-Benz 320 3.4-Liter Cabriolet B, Body by Sindelfingen; S/N 435035; Black/Dark Brown vinyl; Beige cloth top; Estimate $351,490 – $396,843; Recent restoration, 2+ condition; With Reserve; Not sold at Hammer bid of $306,136. – Chromed wire wheels, whitewall tyres, Burr walnut dashboard, white steering wheel and gear shift knob, venting (lower opening) vee windscreen, dual sidemounts with mirrors, dip beam light, dual spotlights, fitted luggage. – Represented as matching chassis and engine numbers. Restored in 2017. This car has paint to a good standard but two pack paint looks too modern and shiny. The radial white wall tyres are dirty unfortunately but understandable. The chrome wheels look good if a little flashy. The seat recovering appears to be vinyl and the top is wrinkled. A modest car in an expensive Sindelfingen dress. 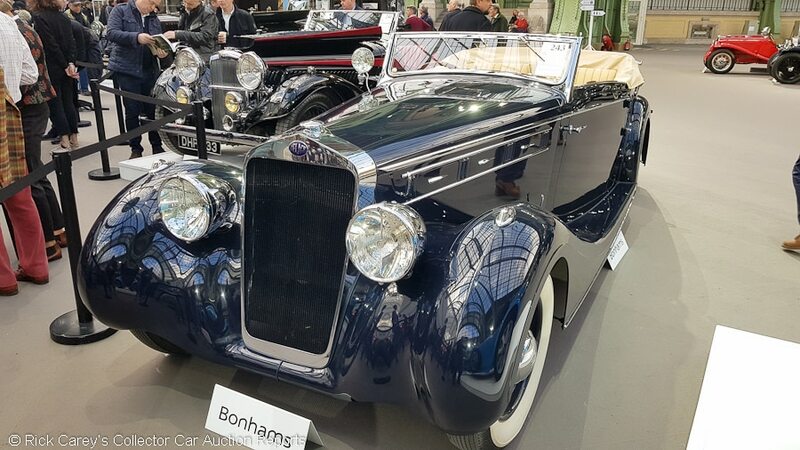 – Mannheim-built side valve six-cylinder M-Bs didn’t often get exclusive Sindelfingen Cabriolet B coachwork and that gives this 78hp car an aura of exclusivity reinforced by an array of sparkly accessories. It’s unusual, but it’s also a mundane Mannheim 320 that could have been let go at the reported bid with little regret. Lot # 248 1926 Bentley 3-Liter Speed Model Drophead Coupe, Body by Freestone & Webb; S/N TN1568; Burgundy, Black fenders/Carmine leather; Black leatherette top; Estimate $453,535 – $566,919; Recent restoration, 3+ condition; With Reserve; Not sold at Hammer bid of $362,828. – RHD. Wood dash, double dickey foldout seats, short wheelbase, SU sloper carburetors – Weymann patent fabric covered coachwork by Freestone & Webb. Restored in the 70’s then redone more recently. The paintwork looks original but has been resprayed a long time ago. The exterior trim has been well maintained and original. A very good interior with no damage or marks. A genuine honest car with less wear and tear than an open sports Bentley. – Not the usual 3-Liter Speed Model, that’s for sure, the drophead coupe coachwork and short wheelbase present a distinctive visual aspect that will get attention even at a Bentley Drivers’ Club event (particularly when a cold rain descends, the top is erected and the windows rolled up while the posh Vanden Plas Tourer replica coachwork drivers are drenched and miserable.) This car was sold by Brooks in London in 1998 for $111,148 when it was described as a “Doctor’s Coupe”. It’s reasonable to think it is worth three times as much 21 years later, but probably not the four times that the consignor wants. Lot # 250 1939 Horch 830 BL Cabriolet D; S/N 8492020; Black/Terracotta leather; Estimate $260,783 – $317,475; Older restoration, 3+ condition; With Reserve; Not sold at Hammer bid of $215,429. 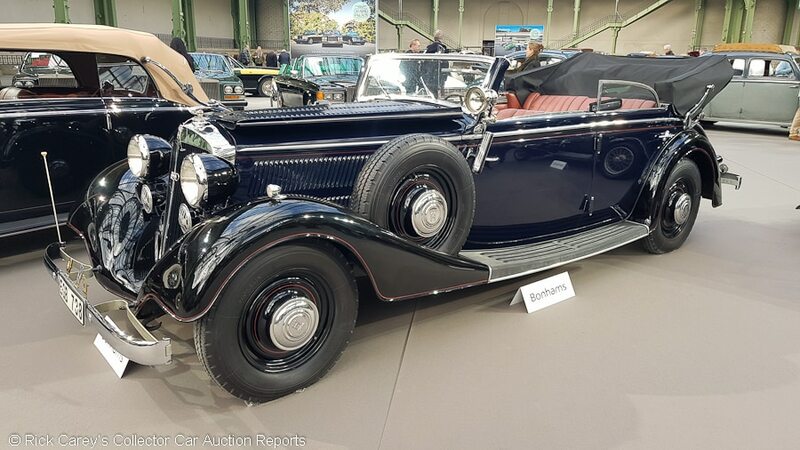 – Black steel wheels, chrome hubcaps, spotlight, black wheels, dual sidemounts, – The last Horch sold new in Sweden, first owned by Major Reinhold Schmidt, later the father-in-law of Ingrid Bergman. Purchased by the father of the consignor in 1973 and restored over the next 24 years. Paint to a very average standard. The door finish is not good enough with visible preparation marks. Some of the exterior trim has faded. The seat leather cracked on all seats. The rear bumpers stanchions are fusty and unappealing. Restored between 1973 and 1997 respecting originality, a poor showing. – This is a seriously undistinguished automobile notable mostly for its many years-long restoration and well-meaning but unimpressive preservation. The Grand Palais bidders were not impressed, either, but the seller should have given their considered opinion more careful consideration. Lot # 254 1937 Alfa Romeo 6C 2300 Berlina, Body by Stablimenti Farina; S/N 814023; Faded light green, Dark Green/Faded red leather; Estimate $328,813 – $396,843; Unrestored original, 3- condition; With Reserve; Hammered Sold at $260,783 plus commission of 15.00%; Final Price $299,900. – RHD. Black wire wheels, Blockley tyres, side window rain deflectors – Utterly unrestored. Rusty stone chips on the nose, wheel arches, doors, and rear. Corrosion patches around the door openings. Superb unrestored original condition with that perfect patina of age. The best type of originality. – A rare surviving Berlina that has somehow escaped being made into a replica sports racer and is impressively valued here for its survival, originality and a lot of money spent with U.K Alfa specialists to make it run and drive credibly, even though it still looks like a hulk. The Grand Palais bidders were apparently intrigued by it, and by the survival of its 4-door coachwork, and paid generously for it. 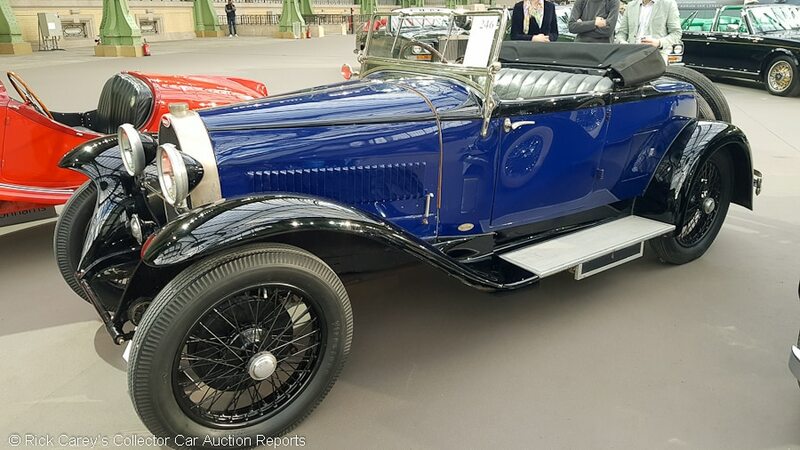 Lot # 255 1928 Bugatti Type 43 Grand Sport Tourer; S/N 43258 (43291 – see text); Engine # 132; Light Blue/Black leather; Estimate $1,417,298 – $1,644,065; Unrestored original, 3 condition; With Reserve; Not sold at Hammer bid of $1,133,838. – RHD. Marchal headlights, cast alloy wheels, cycle fenders, Marchal headlights, single sidemounted spare – First owned by Crown Prince Leopold of Belgium with the chassis plate from his earlier Type 43, proving that even Crown Princes worry about customs duties and aren’t unduly concerned with evading them. Now forever confused with another 43258 (this car’s correct chassis number) that exists. Later shortened and lowered, but later restored to the original wheelbase with a reproduction frame and Grand Sport body. The frame was later replaced by an original frame from 43258. Then there is another car using replaced parts, but that’s too complicated for words. This cars wheels, hubs and drums are corroded. The paintwork is lumpy and very poor. The wind shield surround rechrome is poor and uneven. The gearbox transmission casing is the only unoriginal part. Bugattis and moveable chassis plates: a story too often told. – A million Euros is a generous offer for a car, even a Bugatti, with so many twists and turns in its history. The consignor should have given it serious consideration. 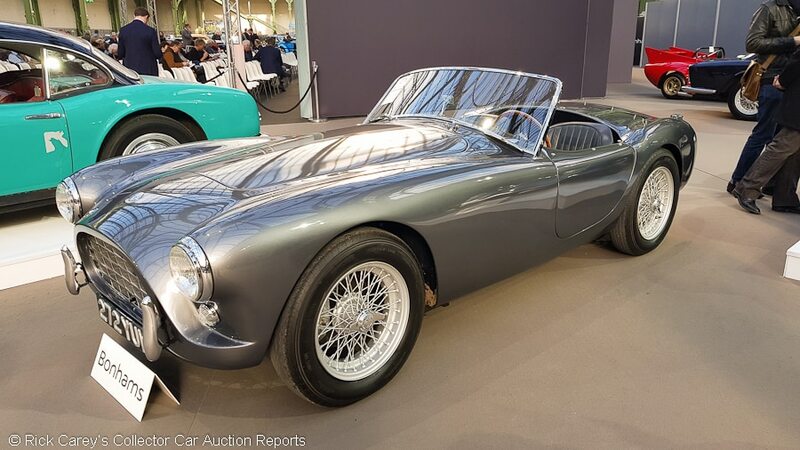 Lot # 271 1958 AC Ace Bristol Roadster; S/N BEX452; Engine # 1105068; Grey metallic/Black leather; Estimate $317,475 – $385,505; Older restoration, 2- condition; With Reserve; Not sold at Hammer bid of $283,460. – Curved windscreen, front disc brakes, overdrive, woodrim steering wheel, black leather covered dash, silver painted wire wheels. – Replacement engine in D2 specs. Restored in 2012, but, oh dear, this car has a very poor paint finish, showing runs and bad preparation. The seats are oldish and showing wear. Restored in 2012 but certainly not to a good enough standard. – Up to 130bhp was available from the Bristol unit in road trim, in which form the Ace could touch 120mph (195km/h), while around 150bhp could be wrung from it for racing. The combination of a fine-handling chassis and a decent power-to-weight ratio helped the Ace to numerous successes in production sportscar racing; arguably its finest achievement being a first-in-class and seventh overall finish at Le Mans. This is not a good example, not to mention the replacement upgraded engine, and it was bid to a reasonable price here. 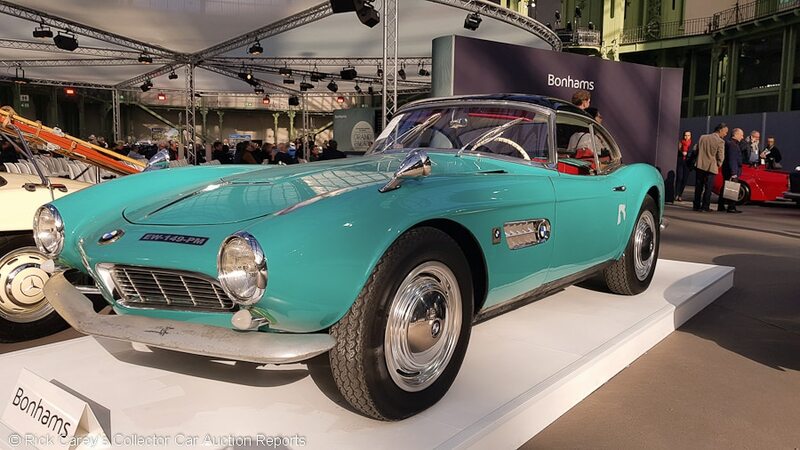 Lot # 272 1957 BMW 507 3.2-Liter Series I Roadster; S/N 70044; Engine # 40051; Aqua Marine, Black hardtop/Dark red leather; Black cloth top; Estimate $2,040,908 – $2,494,444; Visually maintained, largely original, 3 condition; With Reserve; Not sold at Hammer bid of $1,644,065. – Red tonneau, polished wheels, chrome hub caps, complete tool kit, multiband radio. – This car was resprayed in 1960 approximately and the paint is very poor. The chromework is completely dull. The hardtop is chipped and damaged. It has an original aged leather interior and a dirty steering wheel rim. The engine was redone last year by BMW Classic but it was put back in an aged compartment with scraped, peeling paint at a cost of Euros 103K, then serviced for Euros 31k after the 2018 Tour Auto. Ready for full exterior and interior restoration. 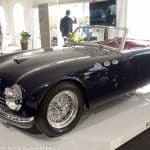 – Offered by RM at Monterey in 2016 with a reported high bid of $1,950,000 (with Rudge centerlock wheels), then at Villa Erba in 2017 bid to $1,535,875. Pouring money into this 507 is not going to overcome the shoddy paint and other cosmetic shortcomings. It is too harsh to call this 507 “nasty”, but it is not good and the consignor is going to have to look hard to find someone willing to overlook its plentiful defects to appreciate the mechanical work that has gone into it. 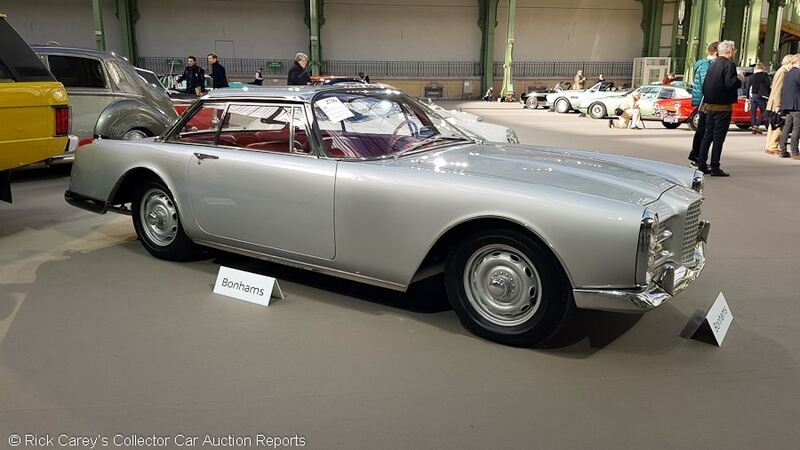 Lot # 276 1962 Facel Vega Facel II Coupe; S/N HK2 A146; Grey metallic/Bright red leather. 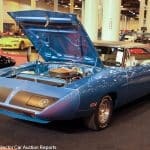 ; Estimate $340,151 – $453,535; Recent restoration, 2- condition; With Reserve; Not sold at Hammer bid of $300,467. – 383/355hp dual quads, automatic, sliding sunroof, electric windows, woodrim steering wheel, red carpets, Borrani centre lock alloy wheels, vertically stacked quad headlights, power steering and brakes, limited slip. 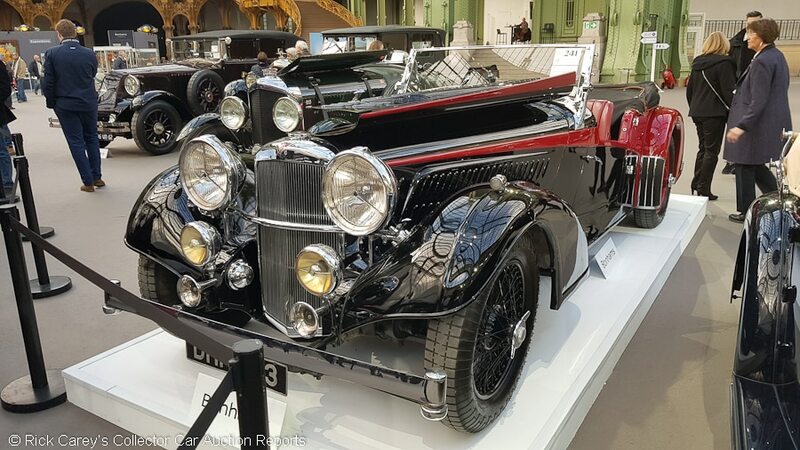 – Restored 2015-17, this rare car (one of 182 built) is very well presented with superbly finished coachwork and of the best interiors you will ever see. The switches and dials are so well made and are incredibly stylish. A delight and a personal favourite. – At the low estimate this would be a hairy good deal in one of the fastest and most luxurious automobiles of its era. That it didn’t get closer to that value reflects a certain myopia on the part of the Grand Palais bidders. 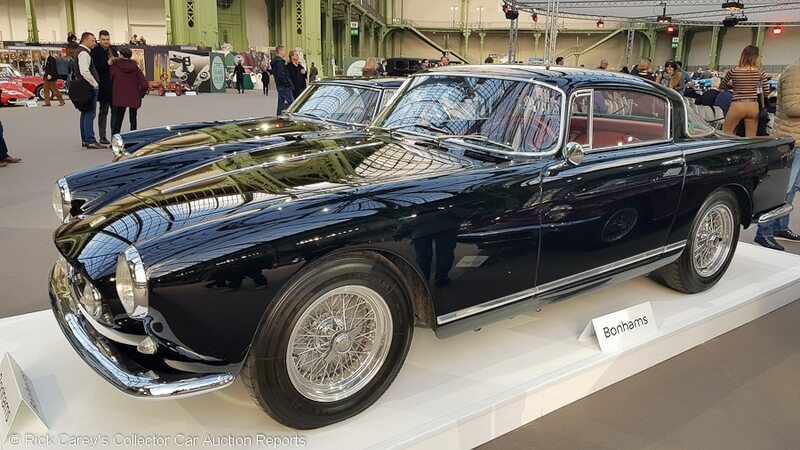 Lot # 277 1956 Ferrari 250 GT Berlinetta, Body by Boano; S/N 0543GT; Black/Red leather; Estimate $1,133,838 – $1,473,989; Older restoration, 2- condition; With Reserve; Not sold at Hammer bid of $1,065,808. – Chrome spoke Borrani wire wheels, woodrim steering wheel. 2,953cc SOHC V12 engine, triple Weber carburetors, 240bhp at 7,000rpm, 4-speed, heater, Marchal fog lights, Ferrari Classiche Red Book certified. – Some U.S. racing history in 1958. This car has new paint yet has dusty wire wheels. It smells good and correct inside, for its age, and the seat cushions are lightly stretched. It has dirty wheel arches inside and exhaust showing a little age which could be very expensive. The exterior trim has been reused without plating which lets it down. A good car, easily improved. – Sold by Worldwide at Houston in 2007 for $550,000, at RM Monterey in 2010 for $440,000 and at Bonhams Quail Lodge in 2017 for $1,133,000 ($1,030,000 hammer), it is no surprise it didn’t sell here at the reported high bid at the Grand Palais. 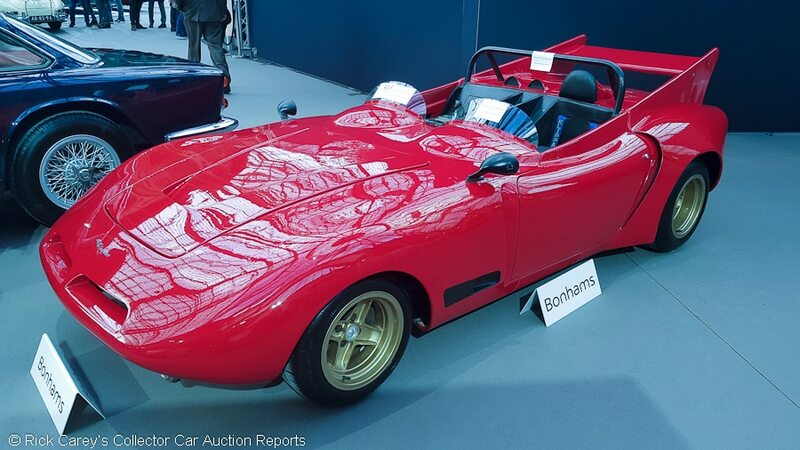 The seller is underwater by a little but this is a rising tide for 250 GTs and it is reasonable to regroup and wait for a more receptive audience. 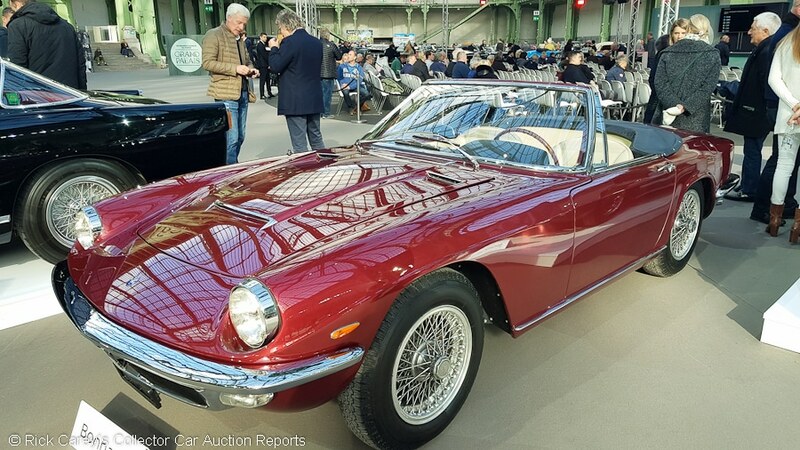 Lot # 287 1964 Maserati Mistral 3.7 Spyder, Body by Frua; S/N AM109007; Ruby Red Metallic/Light Cream leather; Black cloth top; Estimate $510,227 – $623,611; Cosmetic restoration, 3 condition; With Reserve; Not sold at Hammer bid of $453,535. – Weber carburetors, polished outside laced wire wheels, wind up windows, woodrim steering wheel, Lucas FI included. – Represented as matching chassis and engine numbers. The paint finish is excellent but the chrome bumpers are poorly rechromed and are showing lumps and bumps. It has a superb new interior. The dirty arches and wheels attract a critical eye. Fully restored between 1999 and 2010 and single family owned since 1971. A beautiful car let down by erratic restoration attention. – Not the best Mistral around, but more than good enough to satisfy a driving-oriented owner who appreciates style and design, the bidders were unusually reticent in approaching the reasonable low estimate and missed a good buy on a quality, if erratically presented, Mistral. 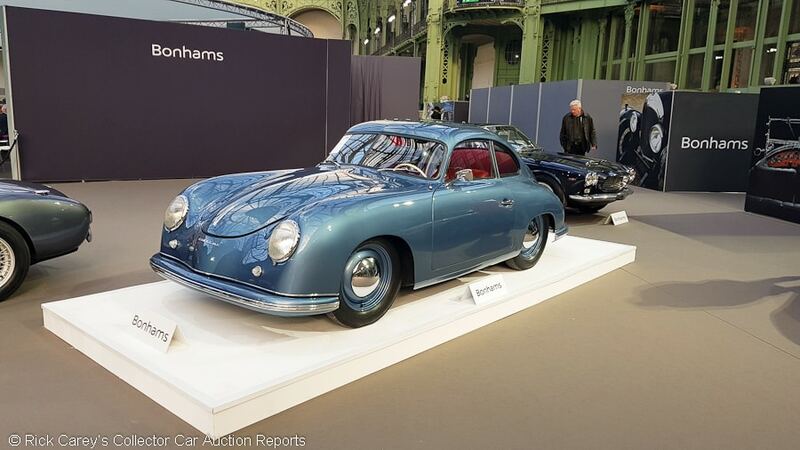 Lot # 288 1950 Porsche 356 “Pre-A” Coupe, Body by Reutter; S/N 5310; Engine # 3690312; Electric light blue metallic/Red leather, cream carpets; Estimate $793,687 – $1,133,838; Older restoration, 2- condition; With Reserve; Hammered Sold at $793,687 plus commission of 15.00%; Final Price $912,740. – Split windshield, steel wheels, white rim banjo-spoke steering wheel, Telefunken radio, chrome hub caps. Stylish door mirrors, pull up radio aerial. – An older restoration but has kept and maintained perfectly and has continued to win concours awards through last year.. This example is as perfect as you could hope for, genuinely sublime. This charismatic “4 digit” early split screen is simply superb, another winner. – Ultra-rare Pre-A split-window ‘four-digit’ coupe, part of the foundation of the Porsche legend and nearly sublimely presented here with a set of numbers that make sense. There will be a gazillion pristine GT3 RS Coupes at a Porsche gathering, but this little split window Pre-A will blow the Porsche faithful’s heads off. It is expensive, but it deserves to be and it will return ample show-off dividends. Lot # 291 1955 Mercedes-Benz 300SL Gullwing Coupe; S/N 1980405500742; Grey/Biscuit leather; Estimate $1,247,222 – $1,700,757; Modified restoration, 1- condition; With Reserve; Hammered Sold at $1,190,530 plus commission of 15.00%; Final Price $1,369,109. – Nardi woodrim steering wheel, centre lock steel wheels, travel luggage, fog lights, no bumpers, Rudge-style center lock wheels, covered trunk mounted spare wheel and period manuals, luggage, removed parts are included. 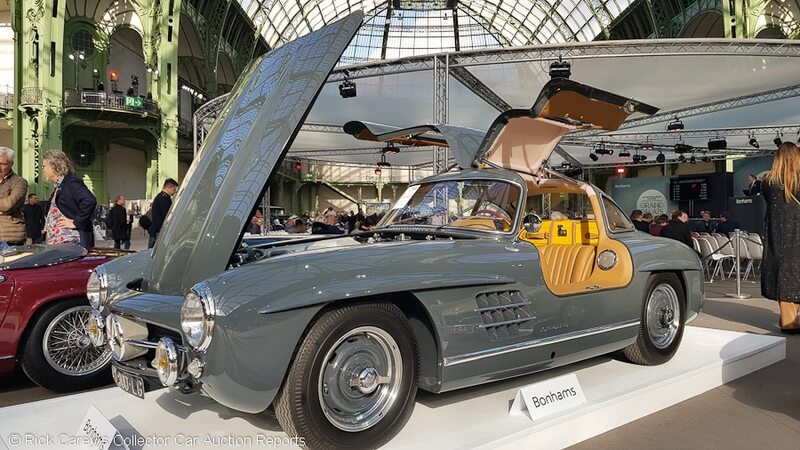 – This Gullwing has been subject to a very thorough and detailed restoration but also has a later aluminum block, cylinder head and gearbox installed in 1973. Restored most recently in 2018 with front disc brakes, electronic ignition and upgraded fuel system. Paint finish, exterior trim and interior retrim are perfection, you won’t find or hope for better. 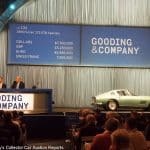 – The buyer really, really wants to drive this Gullwing despite the modifications that render it judging-proof at any M-B event. Restored as it was built it’s worth a bit more, but the buyer here ignored that in favor of better performance and braking; an intelligent choice. 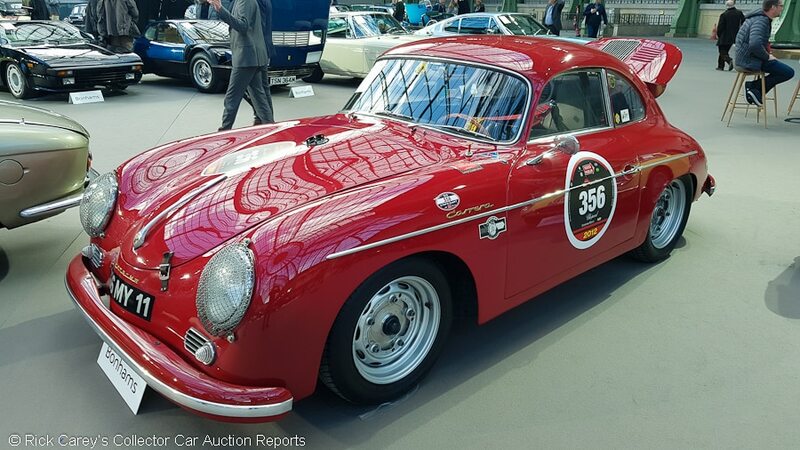 Lot # 295 1956 Porsche 356A Carrera GS/GT Coupe; S/N 56778; Engine # P91005; Red/Black Vinyl and Velour; Estimate $476,212 – $634,949; Modified restoration, 3 condition; With Reserve; Not sold at Hammer bid of $430,858. – Fitted with ultra-rare 692/0 Carrera GT engine – one of approximately 20 built, roll bar, rally seat harnesses, rally timing gauges, alloy doors, bonnet and engine cover, Perspex side windows, Weber carbs, 80 litre tank, upgraded brakes, Sebring exhaust. – Not a GS/GT, a 356A GS upgraded to GS/GT specs with the 692/0 Carrera GT engine during a 1987 restoration. This car has good paintwork but could be better on the scuttle top and areas but we’ll forgive a rally car. The engine bay is used looking which is fine. Small fuel leak near one of the carburetors. The tyres are all fresh with good tread. A good rally car, ready to rumble, but not what it thinks it is. – This is a hot rod. It’s a really good hot rod with a legendary engine, but it’s not how it was born and it should have found a buyer at least at the reported high bid, if not before. 91005 is a ’58 Carrera GT engine. 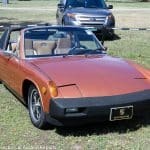 This Porsche is a “tribute”, a fast tribute to-be-sure, but not what it wants to be. 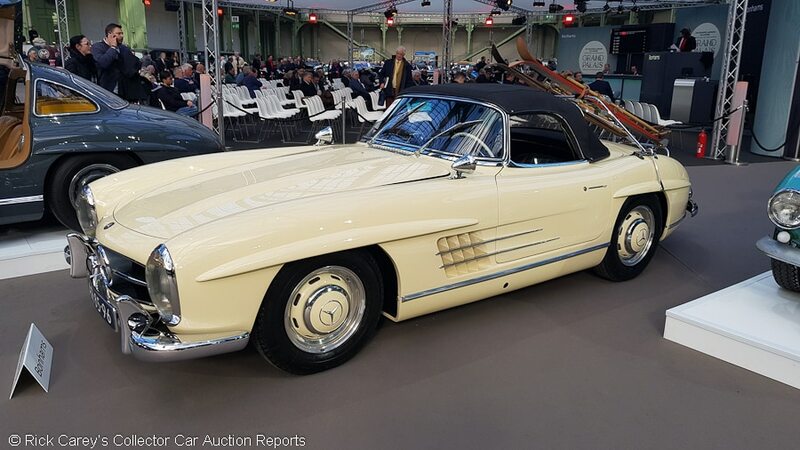 Lot # 300 1958 Mercedes-Benz 300SL Roadster; S/N 1980428500289; Engine # 1989808500292; Ivory/Black Leather; Estimate $1,133,838 – $1,360,606; Older restoration, 3+ condition; With Reserve; Not sold at Hammer bid of $929,747. – Ivory steering wheel and shift knob, steel wheels and ivory painted hub caps, twin outside Talbot mirrors, fishtail exhaust, Becker Mexico multiband radio, fitted luggage, Euro headlights. – Professionally restored in circa 2001 then recently resprayed and re-trimmed in the original colors. Represented as the original engine. The work has been completed to a great standard, the car is unmarked and very smart. The exterior trim has been refitted without plating, which detracts slightly. The engine bay is in original condition, dusty and has old components. A good car, in buyable condition. – Sold by RM in London five years ago in 2014 for $994,286, with a fresh repaint and interior. The 2014 result was then the equivalent of Euros 767,900. The hammer bid here is Euros 820,000 and is appropriate for this 300SL Roadster’s specification and presentation. 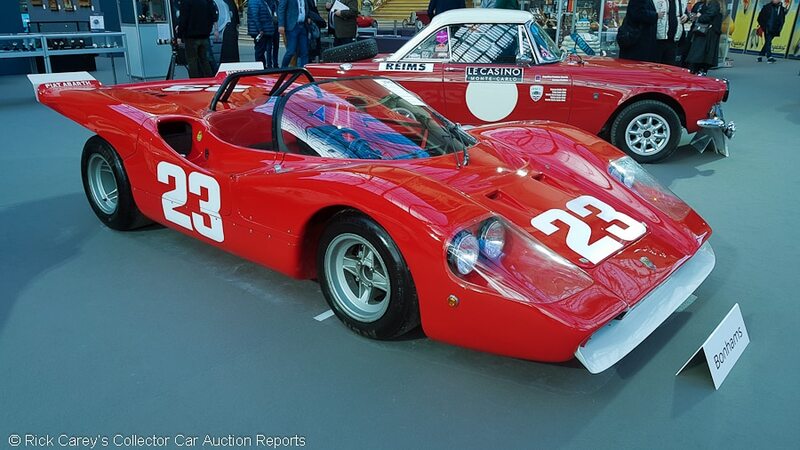 Lot # 303 1971 Bizzarrini 128P Barchetta; S/N 128P01; Red/Black; Estimate $198,422 – $255,114; Older restoration, 3 condition; No Reserve; Hammered Sold at $96,376 plus commission of 15.00%; Final Price $110,833. – 4-spoke gold alloy wheels, Batmobile-like rear fins and wing, small driving lights under the nose, full width rollbar, dual Plexiglas windscreens, small suede rim steering wheel, transverse-mounted 4-cylinder, probably Fiat-based and 1300cc, – One of two prototypes built, featured in numerous press articles. Reborn in the 1990s at the Bizzarrini works from the original body which had been lying in the weeds. This low flying projectile unfortunately has cracks, spider webs and hazes in the glass fibre but that is to be expected. The alloy wheels are poorly refurbished with blemishes showing. Another race car with a fair amount of use. It has a dusty chassis and running gear and will need comprehensive attention before being used in anger. – Offered at Russo & Steele Monterey in 2008 where it no-saled on a reported bid of $62,000, then sold by Russo at Monterey in 2013 for $77,000. The estimate range is creative, the final result is real. 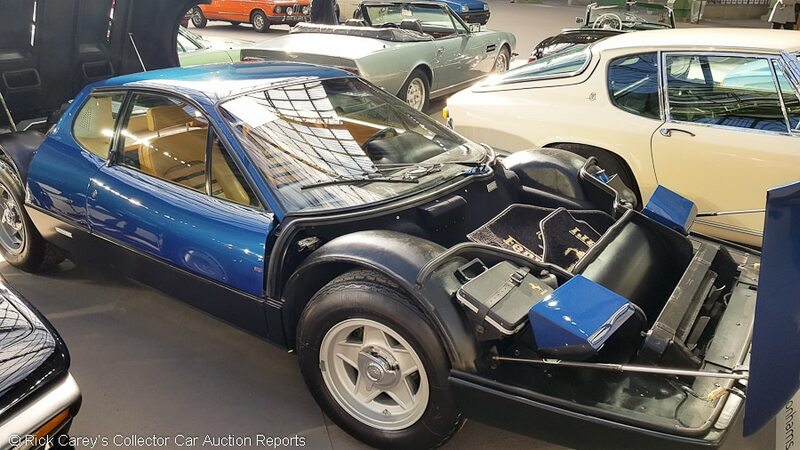 Lot # 305 1974 Ferrari 365 GT4 BB Berlinetta, Body by Pininfarina-Scaglietti; S/N 18173; Blu Dino, Black sills/Beige leather; Estimate $311,805 – $396,843; Unrestored original, 3 condition; With Reserve; Hammered Sold at $274,389 plus commission of 15.00%; Final Price $315,547. – 5-spoke centre lock alloys with 3 prong knock-ons, pop-up headlights, air conditioning, power windows, two pairs of triple exhaust tips. – First thing you notice is the number plate is bent. These details do make a bad first impression and concern you for the rest of the mechanicals. If the owner doesn’t mind a bent plate what else is poor? The alloy wheels are badly refurbished. It has dirty interior vinyls. The exterior paint, parts of it claimed to be original, has very average finish. The headlights are opaque and faded. It has worn original leather but useable. A disappointment in truth. A poorly presented car – It’s a mediocre, old 365 GT4 BB, it carried a mediocre estimate, and it brought an appropriately mediocre price. 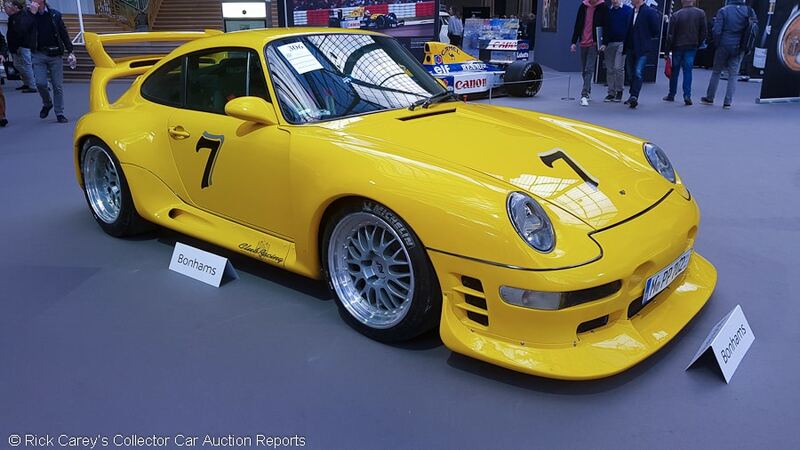 Lot # 306 1997 Porsche Ruf CTR2 Sport Prototype Coupe; S/N W09BC0364VPR06011; Yellow/Black; Estimate $1,473,989 – $1,814,141; Competition car, original as-raced, 2- condition; With Reserve; Not sold at Hammer bid of $1,224,545. – Split rim race alloy wheels, Michelin road and track tyres. Recaro Race seats, race harnesses, rear spoiler, roll cage – The Most Powerful CTR2 engine (702bhp), The first Ruf CTR2 Sport prototype built and the 11th CTR2, Runner-up at the famous International Pikes Peak Hill Climb’s Open Class in 1997. This car has a slightly used/tracked appearance. There are stone chips to the nose and arches and worn mesh areas. The alloy wheels need a better refurbishment and that will be expensive. Race slick tyres look tired. An exciting car that could be improved to get the kerb appeal upwards. – The Grand Palais bidders were insufficiently excited by this Ruf even though the reported high bid is abundant for a Ruf. The consignor must be more excited by owning it than in redeploying the money. Stunning commentary and images, as usual. Thank you. I believe the Horch 830 was the same model that Erwin Rommel was being driven in when he was badly wounded by an RAF fighter-bomber, summer 1944. As Rick says, The Grand Palais is an inspirational setting, a pure delight. Horch is an important old German marque birthed from the shop floor of Mercedes Benz in 1904. The four hoops of a modern Audi badge representing the four companies that Horch merged. I remember the slow but charmingly eccentric DKWs chugging around Madrid in the late 60s and 70s, when I was a budding car fanatic.